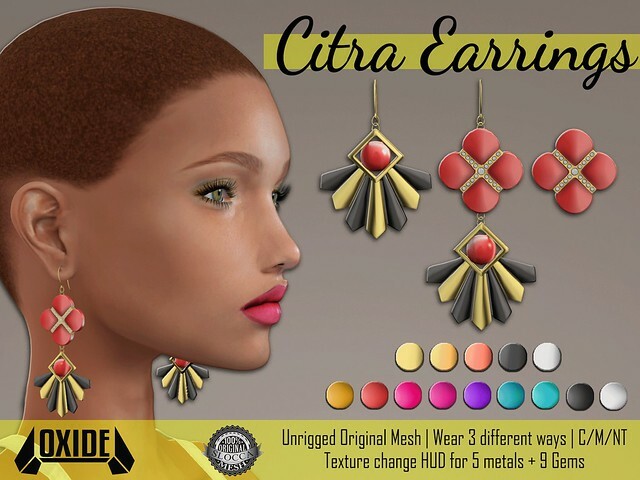 OXIDE Citra Earrings – NEW & 50% off @ SaNaRae! That is why OXIDE made an earring that coud be worn three ways. Wear it whole, or wear only the top (backed by studs, instead of hook) or only the lower part – your choice! Plus, we included tons of texture change options. Texture change HUD with resizer – but it’s mod so you can resize manually if you wish.